Fall is for sure my favorite season… cool, crisp weather, the changing autumn leaves, pumpkins and rich fall recipes, and the start of a very fun holiday season! Last week I placed an order to stock up on my fave fall candle from last year, and I started burning them around the house this week!! They have a wood wick, so the flame makes a crackling sound like a fire – great for setting the tone and ambiance in my house. The scent is very spicy pumpkin, not sweet at all. It is very fragrant and fills up the room in minutes. OBSESSED! While I wouldn’t say I really decorate seasonally, I do enjoy adding pumpkins to my tabletop and front porch, and creating a fall tablescape if I’m hosting friends at my house. I just love this season! Below are some useful entertaining tips for the season, as well as some decorative items to spruce up your space for the fall season. Have a fire going. In my opinion, there’s nothing more relaxing and festive than a warm fire in the fall. It’s inviting to your guests and adds a cozy touch to your space! Light some candles. In addition to adding ambiance, an autumn-scented candle will make your house smell incredible! I just ordered several of these candles – it was my favorite scent last year! It is scented with pumpkin chai, but not in an overbearing or cheesy way… it’s rich, smooth and fills up the whole house. It’s also got a wood wick that crackles like a real fire does as it’s burning – so neat! The night before, get out every serving platter, utensil, and accessory you’ll need for cooking, serving and displaying every food and drink item. You won’t want to spend the evening searching for silly things like cocktail napkins or appetizer picks! Always have fresh flowers. Even the simplest of flower arrangements can add color and freshness to a tabletop or bar. The best way to fill up empty space is with a vase! In the fall you can get creative with deeper colors, add texture with leaves, etc. Last year I made these fun pumpkin flower arrangements that ended up being a huge hit! I even put some on the steps outside my front door. Decide on a theme. Now I’m not suggesting you get cheesy with an absurd amount of pumpkins or something, but establishing a theme will help you stay consistent across the board: from your invitations, to your decor, to your menu, and to your party favors. It could be as simple as selecting a color palette and going from there! Try a seasonal cocktail. Not only will this help simplify the bar menu (stick to one signature cocktail, beer and wine), it’ll allow you to get creative and in keeping with your theme! Don’t miss this fig & thyme cocktail I shared a few years ago – so pretty and refreshing! Love the tip to take everything out the night before! I often find myself in the pantry, taking out 10000 cocktail napkins and serving dishes 5 minutes before people arrive. Love all these items too! This post is so helpful!! 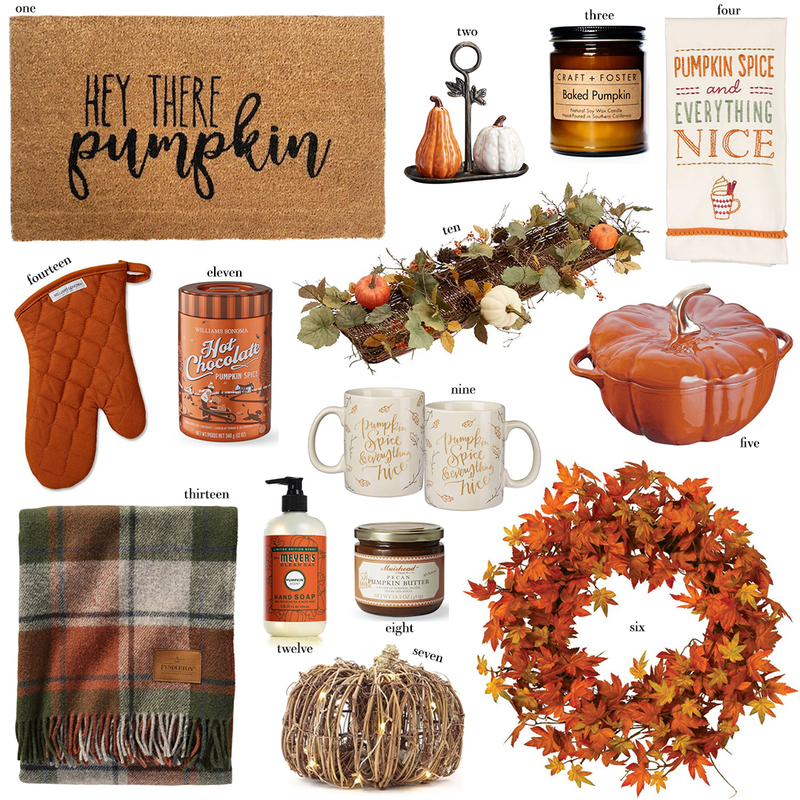 I’ve actually been wanting to add some fall vibes to our Florida home and these are all such great finds and helpful suggestions. Thanks! !